If you know me really well, you know that I wrote a report on hybrid technology my senior year of high school. When the first hybrids came onto the market 7 years later, I didn’t rush to buy one. I admire the technology but up to this point, I’m not completely sold it’s the best approach to the problem. The Chevy Volt approach though has a lot more potential and if it is executed well, GM may just get me to buy a Volt type product. Back in 1994 when I wrote my report on alternative engines for automobiles, the concepts for hybrid car technology is essentially now what both Honda and Toyota have designed. Honda’s approach is to have electric motor work in tandem with a gasoline engine, thus optimizing the use of fuel. Toyota took a different approach designing a hybrid system that can use the electric motor alone, gas engine, or both together. On paper, Honda’s design makes the most engineering sense. In practice though, the Toyota approach is working out much better and is reflected by the higher mpg observed in the Prius line. The Prius can also be converted into a plug-in hybrid, making it a more diverse system. What GM is about to release with the Chevy Volt was not discussed in the research I did back in ’94. It’s a rather simplified approach to the whole hybrid concept. The electric motor does all the actual propulsion of the automobile, while the gasoline engine’s role is simply to provide electricity when it is needed. This basic concept is not new. For example, post 1940’s locomotives, which have proven over 50 years ago how much more efficient they are to directly driven locomotives, use electric motors do the propulsion while a diesel engine or aircraft turbine creates the electricity. Chevy is simply applying the same basic technology in the Volt. What GM’s about to launch with the Chevy Volt isn’t revolutionary as far as technology is concerned. What is revolutionary, is how the technology is being put to use. With the combination of batteries, the Chevy Volt can run without the gasoline engine on short distances. It promises to run without gasoline on most commutes and trips to the store. For most of us, that’s convenient. On long road trips, we have to treat the Volt as a regular car and fill it up every 40 miles, and on local drives in theory we’ll never have to put gas in the car. Brilliant! Here’s where the real excitement comes into the usage of the Volt technology. If you’re a programmer, you know the importance of separating the presentation from logic. 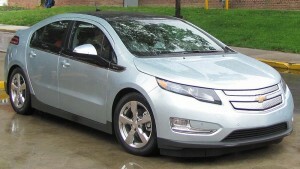 The Volt technology essentially does the same thing with the propulsion and the energy used for the propulsion. So in 10 years from now, if Fuel Cell batteries become cheap and plentiful, the gasoline engine can be replaced by a Fuel Cell. Between then and now, hobbyists will be tinkering with other energy ideas, possibly batteries, natural gas powered engines, etc… The rest of the car doesn’t have to change at all, just the energy creating portion (aka gasoline engine). Taking all this into considering, I think GM has a home run on their hands with the Volt technology. I have two concerns though regarding the cost and how they are marketing the product. First is cost. I think the Chevy volt is just too expensive. The price point of 41k (or 33.5k after a federal rebate) is just too high. The Toyota Prius can be had for nearly 10k less than that not even considering any rebates or tax credits. Like Henry Ford 100 years ago, I think GM should take a risk and put a retail price on the Chevy Volt at 22k (before the federal rebate). The risk pricing something for less than it can be produced is risky though. This is how I propose they get to this price point. Remove the extra technology in the car that lets you manage it from your iPhone. – I think it’s cool, but should be an option. Optionally package less batteries in the car – Yes it may limit the car initially to 10-20 miles before the gasoline engine is required, but it would allow for a lower priced Volt. Price the car based on how much battery capacity the user orders – If the buyer wants full 40 mile on one charge, then price the car at 35k before rebate. The idea here is to get the cars selling, which will drive production costs down. The battery capacity, if it’s possible, should be an option, just like in the past a customer would pick between a V6 and a V8. I also think the Volt technology has a lot of other practical uses which are not being utilized by GM. The biggest is for commercial use. GM should build a Chevy S10 Volt (Chevy Volt-10 🙂 ), with an optional front grill harness so contractors/construction workers can use the truck as an on-site power generator to power tools. It’s a perfect combination, light duty truck that will get great mileage when using the plugin hybrid technology as well as very useful in a commercial setting. GM should also think about creating utility vehicles such as smaller versions of the Chevy Blazer (Chevy Voltzer 🙂 ), specifically for use as a utility vehicle for municipalities, shopping malls, ground keeping, etc… Imagine being able to drive to a location and instantly be able to pull an extension cord out of the front of the grill to power a fibulator or a refrigerator during a power outage. If I was able to call the shots, this utility vehicle would look more like a modern El Camino (Volt Camino) and Nomad (Volt Nomad) car type truck than a traditional truck/SUV. TV commercials would tie together the concept of the vehicle being “green” (good to the environment) not just because it uses less or no gasoline, but because it can last longer since using electric motors for propulsion should last longer with less maintenance than a more complex gasoline engine, and that the gasoline engine that is packaged in the Volt is not the only option this car will have in the future. I’d even show lots of examples of what the car could do for camping, traveling, emergency uses, etc… Just picture a commercial where the power goes out in the house, mom runs outside, runs back in with a special green power cord from her Chevy Volt and plugs the frig into it saving all the groceries. Talk about good for the environment, that just saved all that perishable food! If GM was smart, they would market the Volt car technology not just as a “Green for the planet” product, but as a Swiss army knife automobile that no one should live without. My worry is that GM will destroy this car as fast as they destroyed Pontiac and Saturn (the last 10 years of Saturn and Pontiac set both of those brands up for failure). Hopefully they’ve learned they shouldn’t rename car models from familiar names to letter+numbers (Pontiac) or from familiar letter+number combination’s to words (Saturn) without the consequence of disconnecting product loyalists with the newest product lines. I hope they learned not to pre-market a retro looking automobile (late model Pontiac GTO) then bring to market a car that looks nothing like a 60’s or 70’s GTO (Did you know Ford mocked Pontiac’s GTO at the 2004 Auto show when they introduced a truly retro looking Ford Mustang). GM brass, if you’re listening, there was a reason Alfred P. Sloan in the 1930’s created the Pontiac division from the failing Oakland brand and had it share many parts/components with the Chevy division and that there was a reason why Roger B. Smith and F. James McDonald created Saturn in the 1980’s. Please don’t forget why you’re creating the Chevy Volt. It’s not to compete with other automakers making hybrids, it’s to create a brand that reflects your customers values. Stay Tuned for my related blog post where I discuss my thoughts on the demise of Pontiac and Saturn. One comment on "Thoughts on GM’s Volt Hybrid Technology"
If you will charge GM Volt battery at home and work, with electricity, which isn’t cheap and clean, the life of battery set will be reduced drastically.